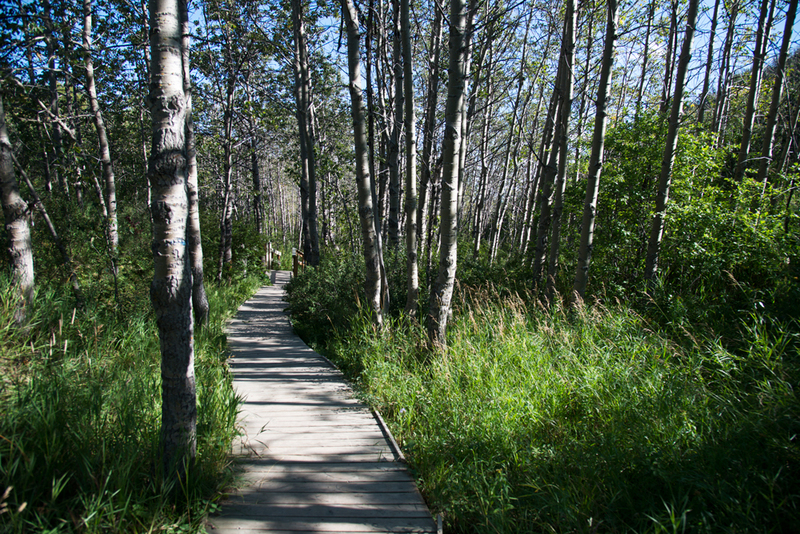 Walk the long stretches of boardwalk through the forested park. Location: 85th Street and 48th Avenue N.W. Things to do: Hiking, picnicking, nature exploration, hanging out with your dog(s) and lots of other dogs. Good to know: Bowmont Park has lots of off-leash areas for dogs to play at, including fenced and unfenced areas. 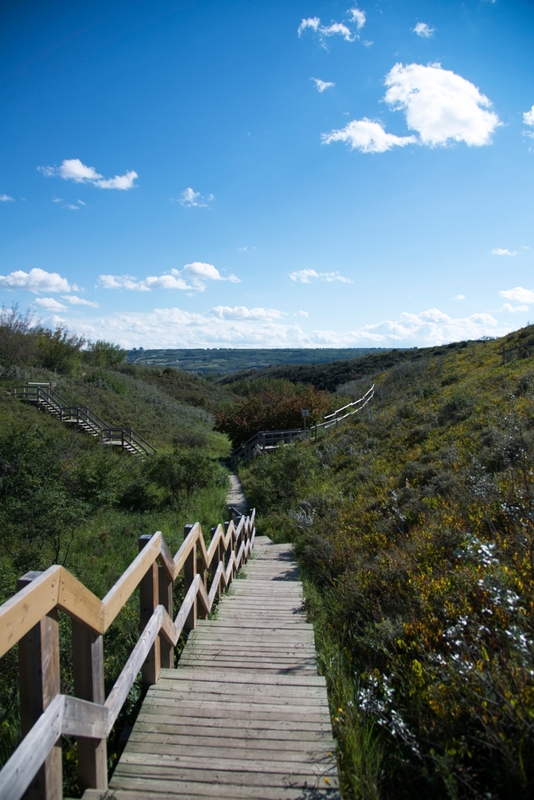 The Park has a variety of landscapes from prairie grassland to riverine forest, and dramatic cliffs with interesting geological features. Trails aren’t terribly well marked, and the park can be a bit difficult to navigate. Take a snapshot of the map at the entry to help you explore. 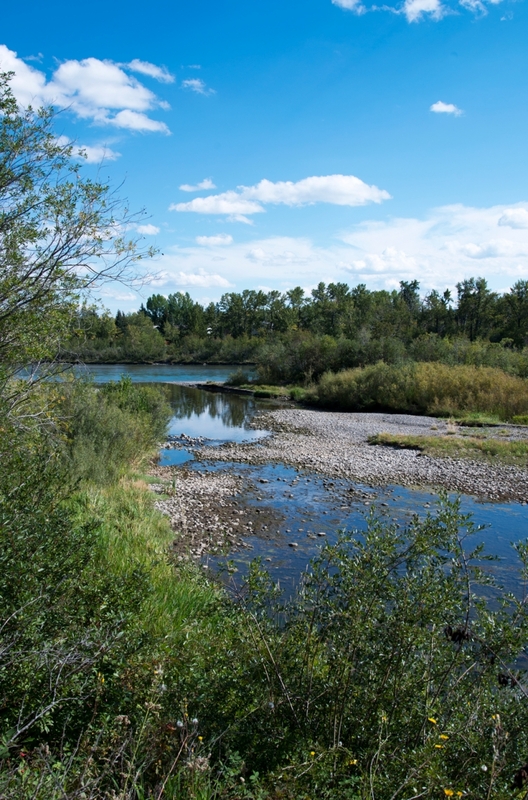 Bowmont Park runs along the north side of the Bow River, between Bowness and Silver Springs. There are pathways along the top of the steep cliffs, and along the river below, so you can get views of the city from its highest and lowest vantage points in one visit. If you park at the lot near the intersection of Bearspaw Dam Road and 85th Street N.W. on the north side of the train tracks, you can follow paved or unpaved pathways to get to the Fournier Area. 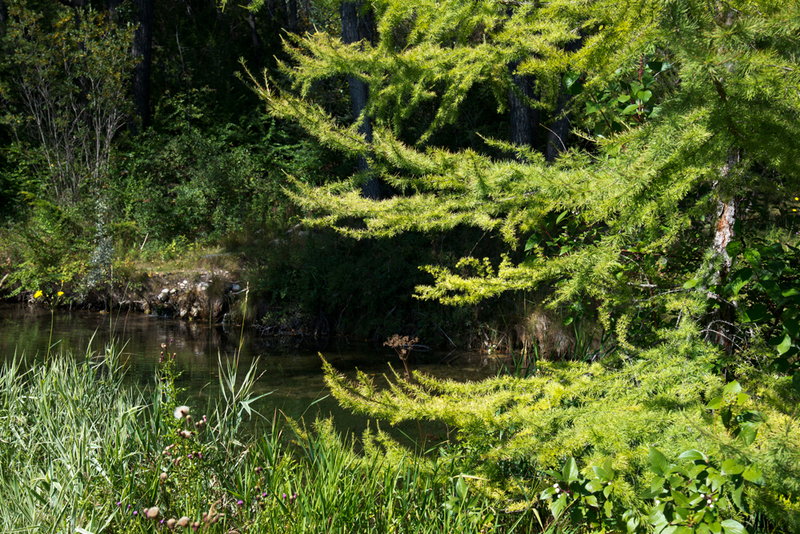 This short loop has some ponds and wetland-type areas where you can see marsh-loving species like the Tamarack tree with its electric green, feathery needles, and, according to the City, Boreal Chorus Frogs and Tiger Salamanders. Park south of the train tracks for quick access to the large fenced off-leash area. This stretch of the park has plenty of access points to the river, including off-leash river access, perfect for your pooch who likes to splash around on a hot day. Plenty of prairie wildflowers are still blooming in the open grassland areas of the park. Look for the brightly coloured Yellow Coneflower, which often blooms right through September. 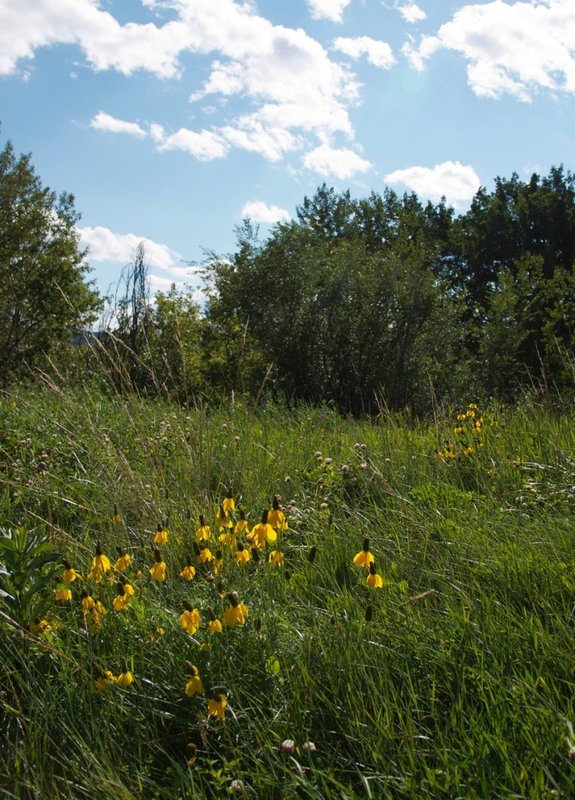 Another great area to explore can be found via the access at Silver Springs Boulevard and 54th Avenue N.W. There are lots of pathways crisscrossing the coulee, but aim for the center of the valley and keep descending on the Waterfall Valley trail. The Waterfall Valley trail is a well-maintained boardwalk that goes through some lovely little forested groves on its way down to the river. As you descend, you’ll notice the water running alongside you in a little stream that gets bigger and bigger, as small tributaries join it along the way (including one that seems to be magically burbling out of the rocks). 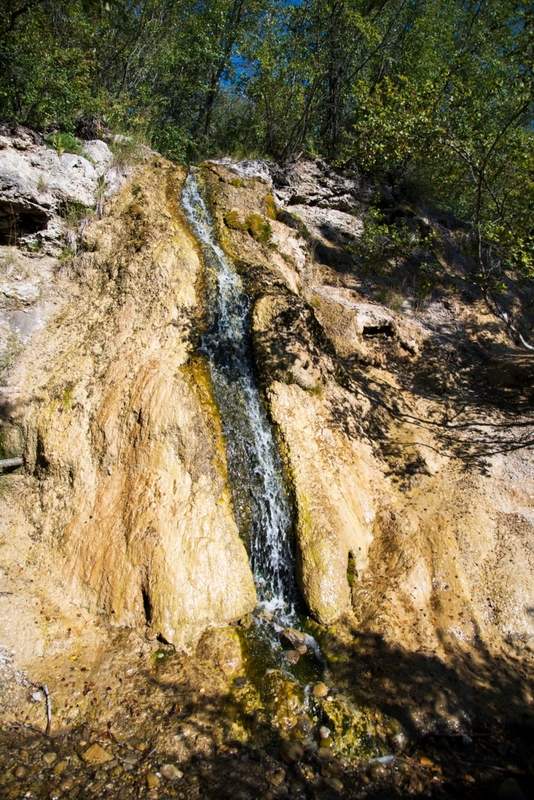 The trail winds up at a beautiful spot with several waterfalls that flow into the stream over a unique type of rock called tufa. It’s a rare chance to actually watch geological processes in action, as this porous rock is being formed right before your eyes as the water deposits minerals. At the end of the trail there’s also a nice lookout point over the Bow River where you can rest for a bit before starting the hike back up the hill!